If your canine companion is getting on in years or has recently suffered an injury to their hind legs, they might require a little more help than usual. It could be that they cannot climb in and out of the car like they used to, or they need a little more support on uneven ground. This can be very difficult to achieve, especially with larger dogs who can be too heavy to lift or support safely or effectively. Whatever the cause a dog lift harness can help in many cases. But, with so many different types and styles of dog lifting harness on the market, where do you start when it comes to choosing the right one for your pet pooch? Our panel of pet experts and dog lovers have put together a list of the 10 best dog lift harnesses to help you make the right choice for you and your dog. 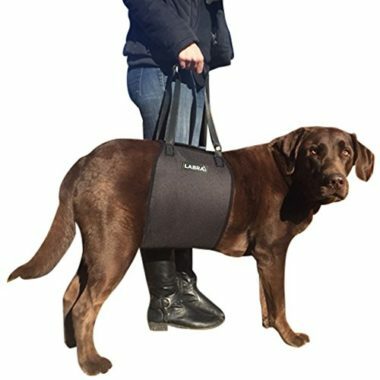 The Labra Veterinarian Approved Dog Canine K9 Sling Lift is an essential accessory if your pet pooch is suffering from limited mobility. The sling enables your dog to continue enjoying activities that they might otherwise find too painful or difficult. It is also perfect for helping dogs undergoing physical rehabilitation. The sling is comfortable and made with a soft fleece lining across your dog’s midsection. The design helps support their weight when you need to lift them, and the adjustable straps give you the perfect fit and support for both you and your dog. The sling is made from strong and durable material and is designed to hold the weight of any dog breed. It is available in four sizes, so you can choose the one that best fits your dog’s size and weight. If you are looking for a harness that gives you control as well as lifting support, then the RUFFWEAR Web Master Secure could be just what you need. Available in six different sizes, the versatile harness includes two leash attachment points. The attachment point in the middle gives you greater control, while the one at the rear allows your dog more freedom to roam. The attachment points are aluminum rings that are reinforced with webbing to ensure a durable and safe connection. The harness also features a padded handle to provide balanced lifting and load dispersal, enabling you to provide the support and assistance your dog needs without putting your own safety and health at risk. The harness is designed to be comfortable for your dog to wear over extended periods, so it is perfect for hiking, extended walks, and runs. It has five points of adjustment, which along with the reflective trim and light attachment loop provide increased security. If your dog requires a little more assistance than usual, then the GingerLead Dog Support & Rehabilitation Harness is the ideal solution. Its simple design is easy to use, adjustable, and guaranteed not to bunch. It is padded for comfort and to support it in maintaining its shape. It is available in a range of sizes and with specific designs to meet the different needs of male and female dogs. The inside of the harness is lined with soft corduroy and the exterior is made from nylon for durability. The whole harness is machine washable and dryer safe. 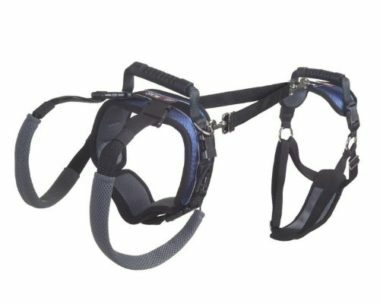 An integrated lead allows the harness to be used alongside your usual collar or walking harness for greater support and control. The PetSafe Solvit CareLift Full-Body Lifting Harness is a versatile harness that can be used specifically for front body support, rear body support, or full body support. Available in three sizes the harness can be used to support dogs from 7lb to 130lb. The harness is designed to reduce pressure on specific areas without transferring that pressure elsewhere on your dog. 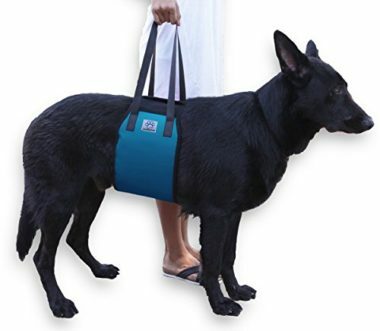 You can lift using the integrated rubber handles, lifting leash, or by using the adjustable shoulder strap. The harness is suitable for use with both male and female dogs and includes a removable shaped protector for males. The belly band and leg loops can be removed, and machine washed. The male protector must be hand washed separately. Regardless of whether your dog is suffering from a degenerative disease or has suffered an injury, the Fur E. Frenz Dog Lift Harness Sling ACL Brace can help. 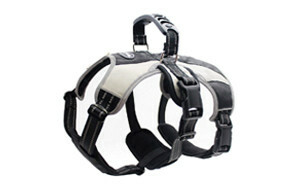 Specifically designed for larger dogs, it comes in large and x-large sizes and can support dogs weighing up to 200lbs. The sling has adjustable straps and is machine washable. The strong and durable harness is padded for your dog’s comfort and sits comfortably around their mid-section. 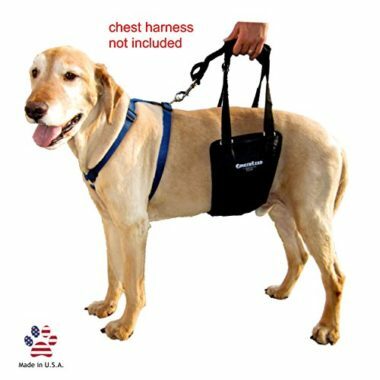 The Love Pets Love Vet Approved Dog Lift Support Harness is a simple and easy to use sling style harness that allows you to support aging or injured pets, or those recovering from surgery. 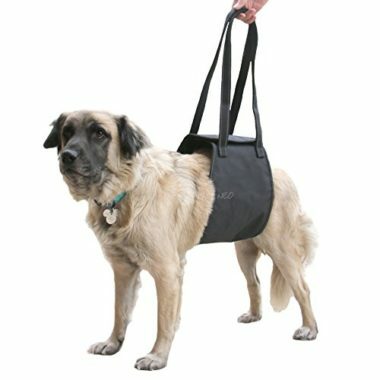 The sling is designed for larger dog breeds and comes in Large and X-Large sizes; allowing it to support dogs weighing over 75lbs. The sling is easy to fit; it sits around your dog’s torso and is secured in place with strong Velcro. The position of the sling can be altered depending on whether your dog needs more support with their front or back legs and joints. It is made from a mix of poly and nylon, making it extremely durable, and has a fleece lining for comfort. If you are looking for an easy to use sling that is specifically designed for large dogs, then the SGT KNOTS Support Harness Pet Sling for Large Dogs could be just what you need. 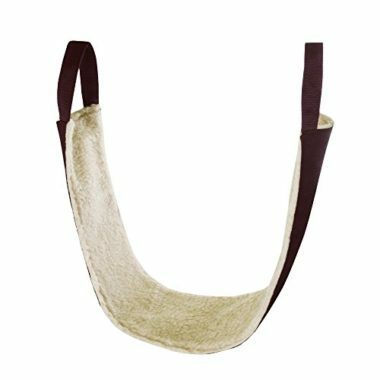 The sling is made from sheepskin and has heavy duty nylon straps to help you easily support your larger dog. The straps are designed to be durable and hardwearing and the harness is adjustable to meet the needs of your dog’s girth. 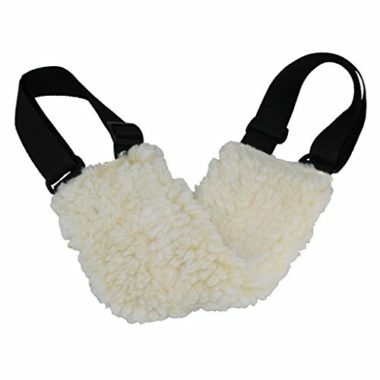 The sheepskin cover on the sling ensures that your dog is comfortable and that the edges of the sling do not rub on their delicate underbelly. The soft fibers also reduce friction, making it a great option for longer walks. The entire harness is machine washable for ease and comes with its own carry case. If your dog has just had surgery or is suffering from degenerative hip disease, then the All Seasons Dog Lift Harness could offer the support they need. The sling is designed specifically to support the back legs and is made with a Sherpa lining for additional comfort. 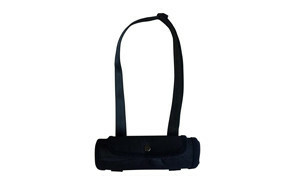 The sling is lightweight, machine washable, and is easy to roll up and store when not in use. It has two strong handles and can be used on most dog breeds. Brand: All Seasons Products, Inc. The Mihachi Secure Dog Harness is a multi-purpose harness that can be used to support your dog’s weight for lifting, used as a training aid, and used to secure them during walks and when hiking. The harness comes in two sizes – medium and large and has five points of adjustment to ensure a perfect fit for your specific dog. 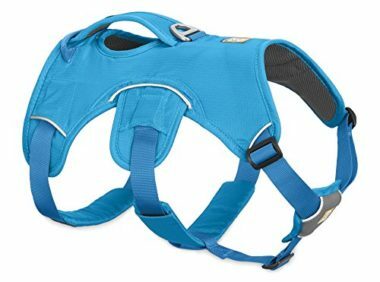 The design ensures that while the harness is a snug fit it does not restrict your dog’s full range of movements. A plastic handle is incorporated into the top of the harness to aid with lifting and supporting your dog. The harness itself is made from high intensity polyester. This makes it lightweight and durable, while ensuring it is also safe and non-toxic. The underneath of the harness is a breathable mesh material, which is skin friendly, soft, and breathable. Foam padded leg loops ensure the harness does not rub and cause irritation. The Max and Neo Dog Lift Support and Rehab Harness is a high-quality padded harness that is available in medium, large, and x-large sizes. The harness is constructed from heavy duty nylon and includes two padded neoprene handles for lifting and overlapping Velcro for securing the harness around your dog. The harness is easy to fit and comfortable for your dog to wear. It gives additional support to dogs with weaknesses in their back legs, hips, or lower spines. As well as knowing the best products on the market, it is important to understand why these harnesses are the best. Knowing what to look for in a dog support sling is vital. In this section of the guide we look at this, as well as why dogs might need a harness, and how best to measure your dog for a dog support harness. We also explore some of the most frequently asked questions about lifting harnesses. When choosing a dog lift harness, you primarily want a harness that is capable of supporting your dog’s weight safely and comfortably. However, as these slings come in a variety of shapes, sizes, and designs, it can be difficult to determine which slings actually achieve this. So, there are some things that are essential to look for in a good lift harness. The material used in a dog sling needs to be strong, durable, and flexible. This enables it to wrap around your dog, support its weight, and last for a long time. However, if it is not also comfortable, your dog will not want to use it. An uncomfortable sling may also rub, causing your dog further pain and discomfort. Poly nylon blends are commonly used, and sheepskin is another popular option. If nylon or similar materials are used for the sling, then the side of the sling closest to your dog’s body should be lined with a soft material, such as fleece. Always check for padding, particularly on the parts of the sling that are in contact with the underside of your dog’s belly. Another area to check for comfort is the edges. If the edges are rough, then these could cause discomfort over time. Don’t forget about your comfort as well. Check the materials used in the handles and straps to ensure you don’t end up with hand cramps or blisters while trying to support your pet pooch. Even with a sling or harness, you are still lifting or supporting a lot of weight. 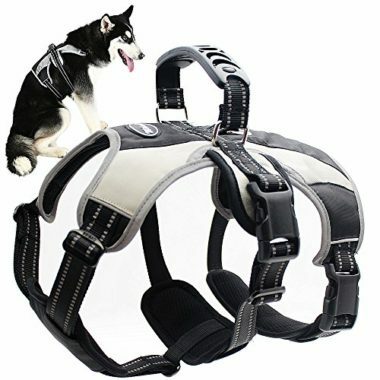 The harness should be designed to distribute the weight of your dog evenly, and to let you hold them at a suitable height. The best either have adjustable straps or multiple carry points specifically for this reason. It is also important that the sling does not shift the weight or put undue stress and pressure onto other areas of your dog. This could cause damage and additional wear on other muscles and joints. A properly fitting harness is a must. If it is too loose, you risk your dog slipping out of the harness or it not working and providing little or no support. If it is too tight, then it can cause rubbing and irritation, and even affect the blood supply to their extremities. Consult the manufacturer’s guide and measure your dog carefully to ensure you buy the right size. Also, when purchased, use the guides to ensure that it is fitted correctly. It is a good idea to test the harness in a safe space indoors, before taking your dog out in it. Why Do Dogs Need Lift Harnesses? If a dog’s hip joint fails to develop properly or suffers increased wear, this can lead to a loss of cartilage. This is known as hip dysplasia and it can ultimately lead to bone-to-bone contact. This causes pain and reduced mobility. A lift harness that is designed to give rear leg support can help a dog with this condition to undertake activities that have become painful and difficult, such as walking up and down stairs and getting in and out of cars. A dog’s strength and stability can be limited by a variety of traumatic injuries including sprains and broken bones. A support harness can help with difficult tasks from stairs to going out to the toilet. It can also ensure that your dog maintains their mobility level and weight, reducing the risk of further health problems that can result from inactivity over extended periods of time. Medication can reduce the pain and inflammation that are a part of this condition, but a harness can also help by providing additional support on days when the condition flares up and increases pain levels and reduces mobility. Gentle exercise is generally beneficial after surgery as it helps to maintain general health and wellbeing. Where they surgery affects mobility levels or means that extra care and support are needed, a sling or harness can help. As well as improving mobility it can reduce the risk of your dog’s stitches popping from over stretching or over exertion. However, you should discuss using a sling with your vet as part of your dog’s post-surgical care. Just like humans, dogs often lose mobility or experience reduced mobility as they age. A lifting harness can help them to maintain healthy mobility and take some of the strain off their joints during difficult activities or during times when they are finding things more difficult. You May Also Like Our Review of the Best Dog Harnesses. The exact measurements you need depend on the type of harness you purchase. You should always check the manufacturer’s guidelines for how best to measure your dog. However, generally, you need to know your dog’s weight to ensure that the support sling can effectively and safely support their weight. The length of your dog’s torso from the joint on the front legs to the joint on the back legs can also be relevant. This prevents you from buying a sling that is too wide and which might rub in these delicate areas. You may also need to know the circumference of your dog’s torso to ensure that the sling you buy fits around them securely but is not too tight. Your dog’s height may be required to ensure that the handles are at the right height for you to lift and support your dog. 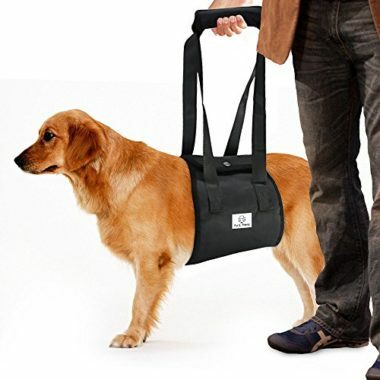 In terms of our top pick, you need to purchase the sling that best fits your dog’s weight and torso circumference. Q: What is a lift harness? A: A lift harness is a heavy-duty strap or sling that fits around your dog and allows you to support their weight when they are unable to do this for themselves. 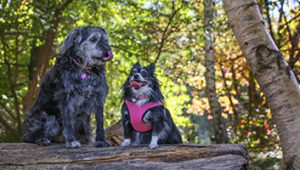 Generally, these types of harnesses fit around your dog’s torso, although they can be combined with a normal walking, hiking, or training harness. The harness usually comes complete with secure closures to keep the sling in place and durable strong handles to help you lift your dog’s weight safely. Q: How do I use a lift harness? 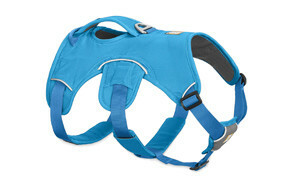 A: Harnesses, such as our top pick, wrap around your dog’s torso, with the lifting straps at the top. The sling should be positioned correctly to distribute your dog’s weight evenly and give you control as well as a good supporting position. Once secured in place, check your dog is comfortable before using the handles to help support their weight. The more you pull up on the handles, the less weight your dog is supporting. It is important to read the manufacturer’s guide for the specific harness that you buy to ensure proper fitting and usage. Q: Can my dog go potty while wearing a lift harness? A: Yes, dogs can go potty while wearing a lift harness. However, some harnesses need to have a protective cover removed for male dogs to urinate without it going all over the sling. Q: How do I clean a lift harness? A: Most harnesses are machine washable. Some can also be machine dried, but most should be air dried. Check the manufacturer’s instructions to ensure that you take the right care of your lift harness. Our top pick for the perfect dog lift harness is the Labra Veterinarian Approved Dog Canine K9 Sling Lift. This harness is an essential accessory if your pet pooch is suffering from limited mobility. The sling enables your dog to continue enjoying activities that they might otherwise find too painful or difficult. It is also perfect for helping dogs undergoing physical rehabilitation. The sling is comfortable and made with a soft fleece lining across your dog’s midsection. The design helps support their weight when you need to lift them, and the adjustable straps give you the perfect fit and support for both you and your dog. The sling is made from strong and durable material and is designed to hold the weight of any dog breed. It is available in four sizes, so you can choose the one that best fits your dog’s size and weight.